Ah, the beautiful sound of music! You might not notice, but you're pretty much surrounded by it wherever you go - even if your MP3 player is not a well-established part of your body. The car, the cab, the train, the mall, the office, the pub, the annoying douchebag listening to douchebaggery on his phone's speaker, the elevator, MUSIC EVERYWHERE! Whenever asked what kind of tunes I enjoy, I used to say "eh, I don't really listen to music". Then it hit me. O, well. Some of my friends possess music collections that would put many radio stations to shame. 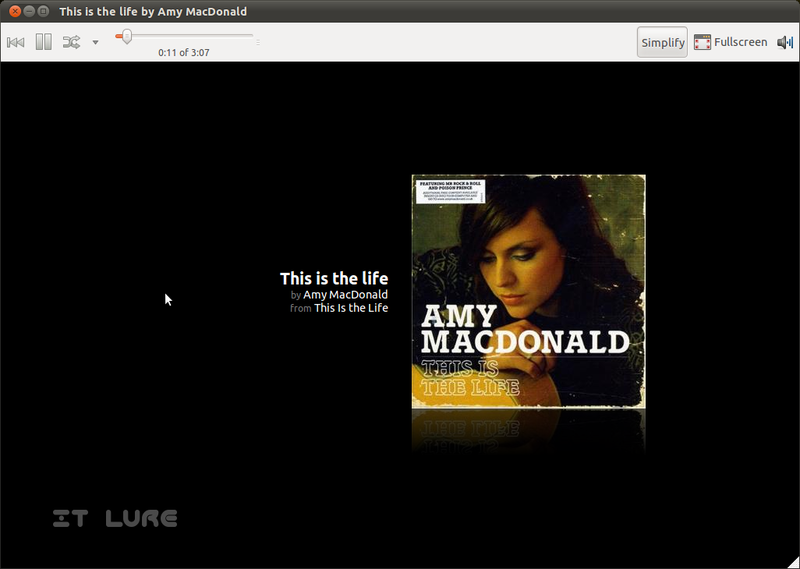 I, on the other hand, have a handful of favorites which follow me from the Ubuntu One cloud up above. 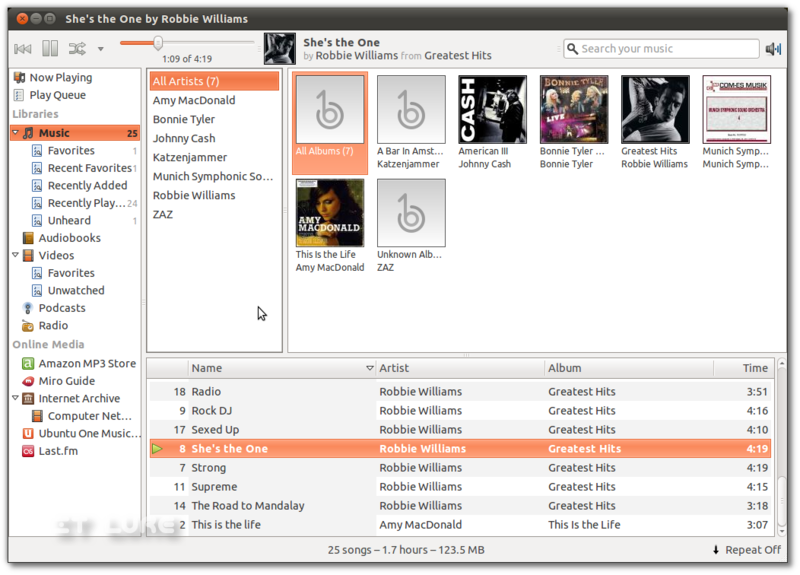 Today, I summoned them to help me form an opinion about the Banshee Media Player 2.0, now the default multimedia app in Ubuntu 11.04. Most of the distros out there will provide quick access to Banshee. If it's not installed by default, it shall most likely be found in their repositories. The official website offers quick and clean instructions for how to get their software on: openSUSE, Ubuntu, Foresight, Fedora, Debian, Mandriva and even Mac OSX and Windows - still in development these last two. With a fresh install of Ubuntu 11.04 Beta 2, Banshee was already there, waiting to "tickle my ears in a pleasant way" (copyright Ion Luca Caragiale). As I started feeding it with MP3s, a polite notice popped up, informing me about the lack of support for this file format. Not only that, but it allowed me to simply click a button and the problem was fixed in under a minute. Then, the first problem arose. Even though my /home/Music folder was set to be the place from which Banshee automatically pulls songs from, my Library wouldn't update itself. Fortunately, I managed to jump-start it by manually importing the folder. Now, as I add/remove tunes, Banshee follows along almost instantaneously. But let's talk a bit about the interface. The main window is sectioned into 5 parts. On the very top, you have the playback controls - back, pause and next. 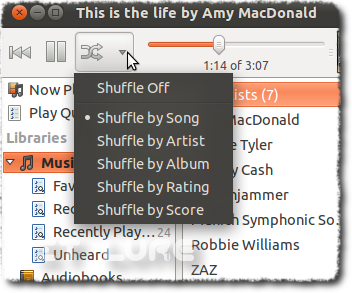 A little arrow on the right brings a drop-down menu, allowing for various shuffle options by: Song, Artist, Album, Rating, Score (more on that later). The next piece displays the current position of the song both on a slider and in a more precise "mm:ss of mm:ss". The cover art + title + Artist + Album of the currently playing tune is next. Just left of the volume control, you have the "Search" window which sports a realtime, "as you type" functionality. 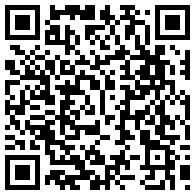 I have no idea how fast this works on a 1000+ archive, but, for me, it's lightning fast. On the left of the interface, you have access to the various noise categories: Music, Audiobooks, Videos, Podcasts, Radio, Miro, Amazon MP3 store (doesn't work inside Romania:(), the Internet Archive (what a resource folks, what a bloody good resource), the Ubuntu One Music Store (which works, but is mainly filled with no-names or karaoke versions of popular songs) and Last.Fm. Next up, the "Artists" section - nothing to explain here, all the artists found in your library are alphabetically arranged. Oh, and you have an "All Artists" category at the very top. The next section displays the albums from within the selected Artist. Down below, you have the actual songs, respecting the previously set criteria. And finally, on a thin status bar, you get cool info such as the total number of songs, along with duration and size, as well as a "Repeat" modifier. Now let's talk a bit about the "Shuffle" option, which is not your plain and simple, pick a random song out of my whole collection thing. Along with the helpful, by artist, by album, by rating options, which basically allow you to create ad-hoc playlists, you get a "by score" option, which gets smarter and smarter as you use Banshee. It remembers what songs you skip and what songs you listen to all the way through and creates a score based on these factors. The bigger the score, the most likely the song will be picked by the random contraption. Banshee also creates a default set of playlists - "Favorites", "Recently Added", "Recently Played" and "Unheard" - which obviously change when the corresponding conditions are or no longer are met. 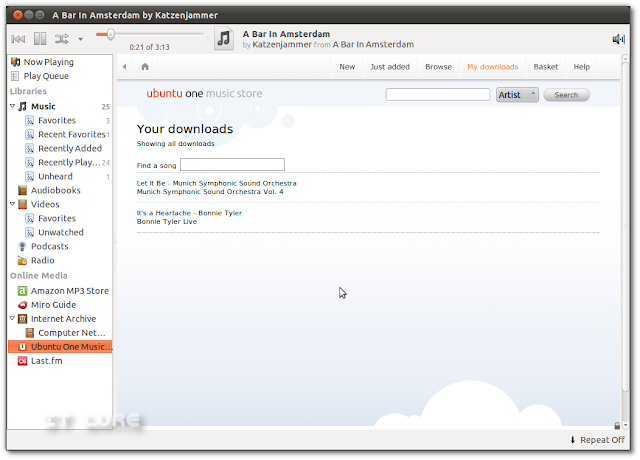 The Ubuntu One Music Store integration is pretty well made, even though it hiccups from time to time, especially when browsing the online archive. At least my paid-for music is downloaded and placed where it belongs, unlike the previous Ubuntu release + Rhythmbox combination. 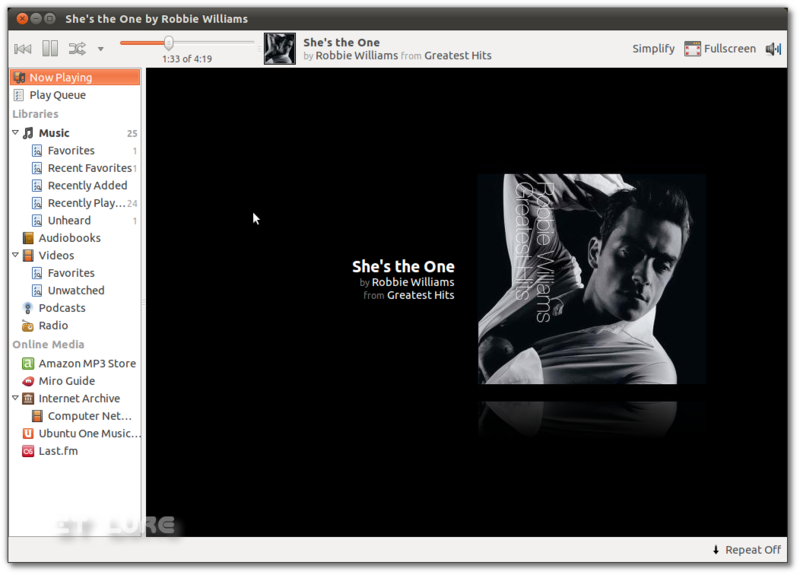 While having the "Now playing" window active, you can choose to "Simplify" the interface, which removes the left pane and status bar. Obivously there's also the possibility to fullscreen the videos. An awesome ability of Banshee is to create smart playlists, which lets you fine tune your collection by choosing from 33 (yes, I actually did count them :D) variables, ranging from "file location" to "sample rate" or "skip count". 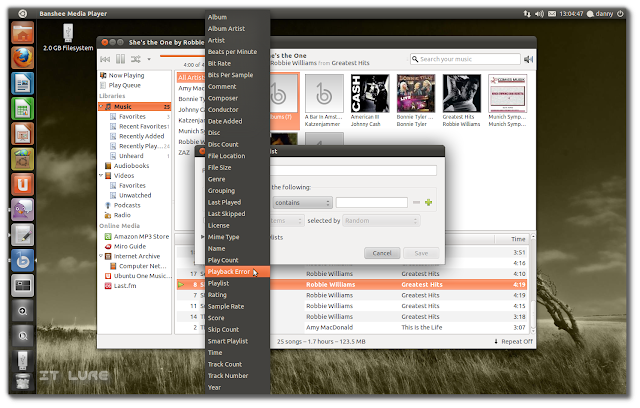 You can thus create a myriad of playlists for different scenarios. 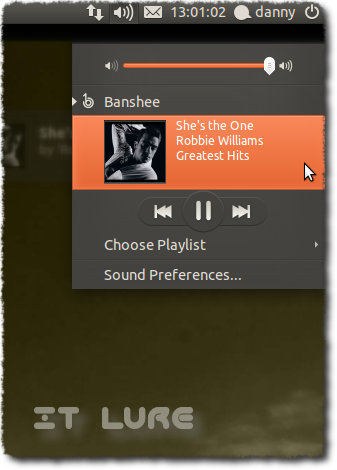 Banshee also supports extensions, and comes with a solid selection by default. Some quick examples: Cover Art Fetching, Library Watcher (aha! this was actually unchecked, so here's my answer to why it didn't fetch my music at the first "boot"), Mini Mode, Podcasts. A lot of keyboards nowadays come with a standard set of multimedia keys. I am delighted to report that Banshee bows to their commands flawlessly. If you have a standard, plain one, you will still be able to easily control Banshee by going to your "Sound menu" and switch tracks and playlists from there. Sticking to the hardware area, Banshee supports all sorts of players, be they iPods, Zunes or "regular" mass-storage devices. As I own a Samsung Galaxy Mini (which is known to be fully supported), I plugged it in, waited to be recognized by Ubuntu and... nothing happened inside Banshee. I looked online and found a ticket in Launchpad, so apparently there is a bug that will hopefully be fixed before Natty is released. (which is tomorrow btw :D). Banshee certainly offers a healthy amount of features and a smooth overall experience. But to be able to sustain them, it does need a similarly healthy amount of RAM - up to 100 MBs, sometimes even more. On modern PCs, this should not be a worry, but if you're keeping an older machine alive, you might want to consider other options. As far as stability goes, it did crash once, but I'm pretty much sure it had to do with the beta state of the operating system. To sum it up, Banshee is a powerful multimedia app that is getting better with each new release.